The Saint Emilion, a sumptuous Paris Perfect apartment with all the flair and style of its 7th arrondissement setting, right in the shadow of the Eiffel Tower. The gracious LIVING AREA is a royal delight, with a beige and soft sand color scheme that’s brightened with bold yellow accents. The long sofa, which also converts to two single beds, overlooks two sets of French windows and the ensuing FRONT ROW EIFFEL TOWER VIEW and its glittering nightly light show. The DINING NOOK, located just steps away, is the perfect setting for a romantic dinner or a family meal, while the KITCHEN is an inspiring starting point for gourmet meals. TWO LOVELY BEDROOMS are found at the Saint Emilion, including a compact bedroom with two single beds (perfect for small children!) and a master bedroom with a queen-sized bed. Both rooms have gracious windows, soft white and butter yellow accents, and a bevy of built-in storage to maximize space and effortlessly store those accumulated treasures. The MODERN BATHROOMS, lined in delicate tile and featuring streamlined and contemporary fixtures are ideal havens for preparing for a night out on the town. In addition there are 2 large mobile AIR CONDITIONERS to keep you cool on hot summer days – a rare luxury in Paris. Please note: this property is suitable for a maximum of 4 adults only. 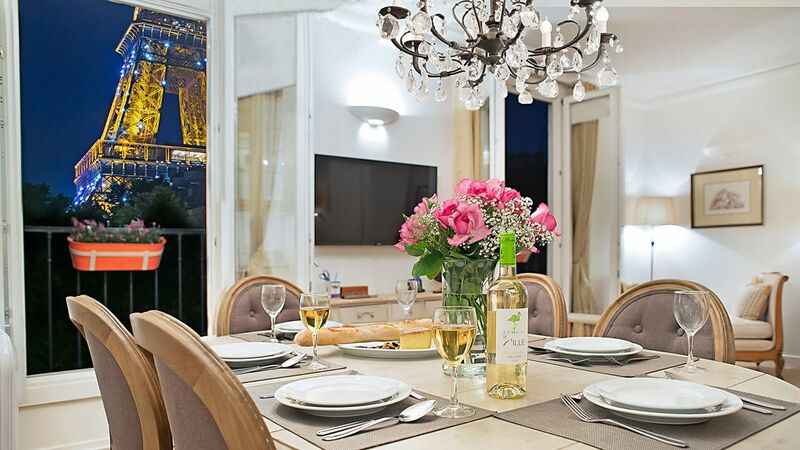 Our Saint Emilion apartment rental in Paris is one of our most romantic, with incredible straight on views of the Eiffel Tower, the Champs de Mars Gardens and the cafés and shops below. Guests tell us time and time again that watching the nightly lights on the Eiffel Tower from their balcony was the highlight of their vacation. Two powerful air conditioners: excellent mobile units which cool the apartment beautifully. Like all mobile A/C in Europe, the hot air is vented thru the windows via a large tube. Fully-equipped with pans, pots, utensils, cookware, dishes, glassware, and so on. Television: CNN and other English news channels available. small decorative balcony where you can stand and enjoy the view.